We'll have eight days and seven nights aboard our own private and exclusive yacht, the 14-passenger Natural Paradise. We'll have a naturalist guide with us in addition to our pro photgraphers and leaders, Andy Williams and Lisa LaPointe, and will have access to areas that the big boats can't get to, and most importantly (as long as we follow the rules of the Galápagos National Park), we have the ability to go ashore on our own schedule, so we won't miss the best light and sightings. With photography as our priority, we’ll make sure that mealtimes are scheduled around our shoots, not during. We'll walk in the footsteps of Charles Darwin who visited here in the 1830's on the HMS Beagle, and we'll try to channel his experiences as he formulated his theory of natural selection. Everything is all-inclusive so you don't have to worry about anything but taking and making great photographs. With a small group, a brand-new luxury yacht, and two amazing pro photographers leading, this trip is sure to fill up fast, so click the "Sign Me Up!" button and we'll see you in The Galápagos! May 12, 2019: Arrive anytime this day in Guayaquil, Ecuador. Take the hotel shuttle or a taxi to our hotel in town. Relax and unwind. May 13, 2019: We will have some informal shooting in Guayaquil, capturing this beautiful coastal city of Ecuador. We'll head out after breakfast and return to the hotel later in the afternoon. We'll all meet at 6:00 PM in the hotel lobby, and head out to our group welcome dinner. May 14, 2019: After breakfast we will head to the airport for our flight to The Galápagos, Baltra Airport. We'll board our private yacht and then we will set our sights on Eden Islet. 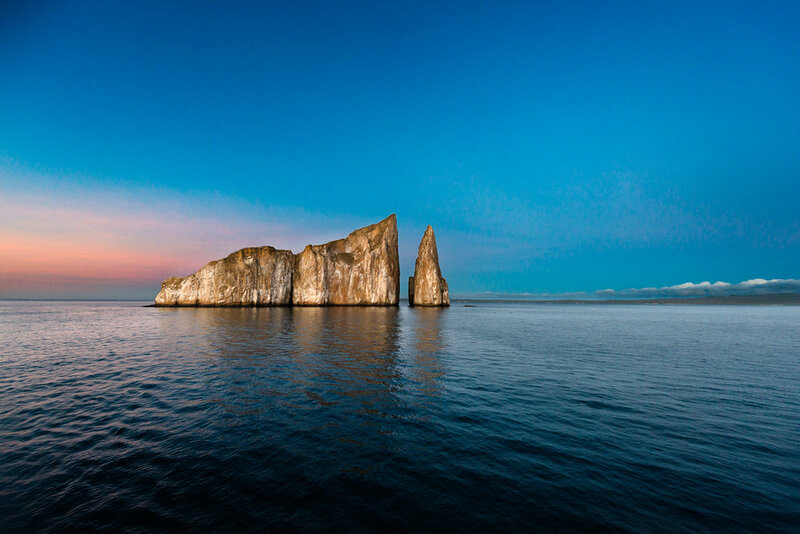 Off the western coast of Santa Cruz Island, Eden Islet offers visitors a great chance to see a variety of Galápagos wildlife, both on shore and under the water, from the zodiac ride . Here we'll explore via our zodiac, and look for salaams, reef sharks, Nazca and blue footed boobies. May 15, 2019: Vicente Rosa Point is located on the northwestern coast of the island and comprised of two separate coves, this site is a large bay with spectacular sea life. Seahorses, sea turtles, and the strange yet fascinating Mola mola (sunfish) may be spotted here. This bay is great for diving and snorkeling. Here again we'll snorkel and explore also via zodiac, and look for Penguins, blue-footed boobies, terns, Nazca boobies, sea lions; snorkeling: sea turtles, rays and puffer fish. In the afternoon, we come to Espinoza Point. 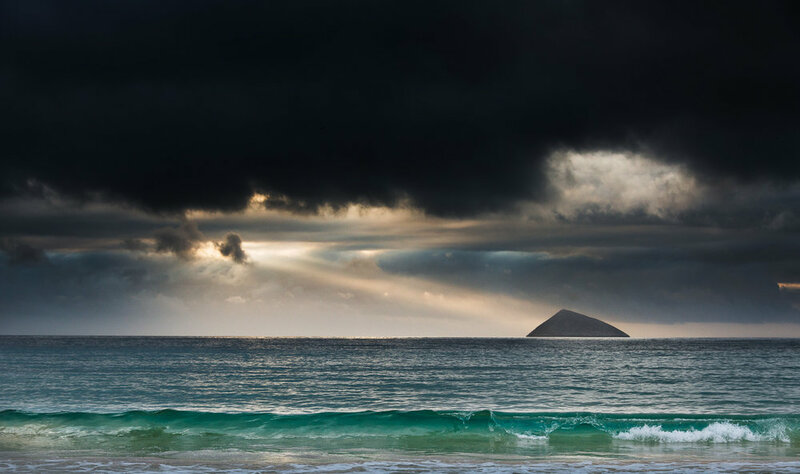 No foreign species have ever invaded Fernandina Island, and therefore it is one of the world's most pristine island ecosystems. The volcano “La Cumbre” dominates the landspace with lava fields reaching the ocean. The island's highlight features the flightless cormorant nesting site. 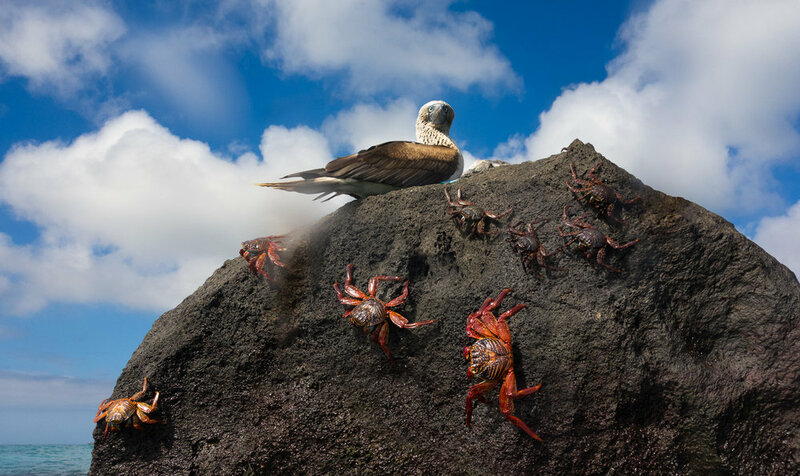 This area provides a great opportunity to see the Galápagos hawk. We hope to photograph Flightless cormorant, marine iguanas, 'a'a lava, sea lions, penguins, active volcano “La Cumbre”. May 16, 2019: We are on the island of Isabela. Urbina Bay is located at the base of Alcedo Volcano on the west coast between Tagus Cove and Elizabeth Bay. This area experienced a major uplift in 1954 causing the land to rise over 16 feet. The coast expanded half a mile out leaving marine life stranded on the new shore. This area is also a great place for snorkeling. Highlights: Land iguanas (the biggest in the Galápagos), hawks, coral reef, giant tortoises; snorkeling: turtles, rays, tropical fish. In the afternoon we will have snorkeling, zodiac ride and a short hike at Moreno Point, which is located near Elizabeth Bay on the west coast of Isabela Island. The plethora of birds seen during a dinghy ride along the striking rocky shores or a hike along path through lava rock leading to tide pools and mangroves create a birdwatcher’s delight. In the tide pools, green sea turtles or white-tip sharks can be spotted. We can also find here flamingos, gallinules, and pintail ducks. May 17, 2019: On the island of Isabela, The Sierra Negra Volcano boasts the largest basaltic caldera in Galápagos at 9 x 10 km. The site offers impressive views and the opportunity to observe up to 7 species of finch and a rich display of vegetation. The north side of the caldera provides evidence of its most recent volcanic activity in 2005. Here we'll photograph the basalt caldera with stunning views. In the afternoon we will visit the Puerto Villamil, "The Wall of Tears". From 1945-1959, a penal colony hosted prisoners who were forced to build this wall, stone by stone, in isolation. This now historical site (El Muro de las Lágrimas), towering at 65 feet (25 m) high, took the lives of thousands during its construction. Locals claim to hear cries emanating from the heavy energy surrounding the site. We'll explore further into the wetlands of Isabela Island, which are located just outside of Puerto Villamil. The Wetlands consist of lagoons, swamps, and mangroves and are home to a variety of unique bird species such as common stilts, whimbrels, white-cheeked pintails, and gallinules. The Wetlands can be visited on foot via a path that winds through the swamps. Finally, we'll stop at the Tortoise Breeding Station. This center was created to protect animals in their first years of life from the threats of foreign species such as pigs and donkeys. Giant tortoise eggs are collected and brought to the center where they are hatched and kept for five years before being released to their natural environment. May 18, 2019: Chinese Hat Islet. This small islet is located near the southeast coast of Santiago Island. Its name comes from the distinct shape of the islet's summit. This small islet is a great location to view many geological formations such as lava tubes and lava flows. We'll hike here, and there is a chance for snorkeling as well. In the afternoon, we visit Mosquera Islet, located between the islands of Baltra and North Seymour. This reef of rocks and coral (the result of an uprising) is only 160 meters across at its narrowest width. This island has one of the largest populations of sea lions and is home to many shorebirds. There have been occasional reports at this site of orcas feeding on sea lions. May 19, 2019: On Floreana Island, we'll of course stop at Post Office Bay. In the 18th century whalers passing through the islands placed a wooden barrel on Floreana Island for use as an unofficial mail box. The tradition continues today as visitors leave addressed postcards in the barrel and sort through left mail to deliver at home. Afterwards, we will head to Cormorant Point. This site hosts a large flamingo lagoon where other birds such as common stilts and white-cheeked pintails can also be seen. The beaches on this island are distinct: The “Green Beach” named so due to its green color, which comes from a high percentage of olivine crystals in the sand, and the “Four Sand Beach” composed of white coral. Our last stop this day is Champion Islet, named after the whaler Andrew Champion, is a small island located just offshore Floreana Island in the southern part of the Archipelago, considered as one of the most beautiful places on Galápagos for all snorkeling and diving fans and an excellent opportunity for dolphin watching. May 20, 2019: We are at Española Island. First stop, Suarez Point, great for spotting blue-footed boobies, albatrosses and Nazca boobies. A beautiful site on the ocean front, the large waved albatrosses use the cliff as a launching pad. The famous attraction is the magnificent blowhole, spurting water high into the air. This site presents wonderful photograph opportunities. In the afternoon we will visit Gardner Bay. This the breeding site of nearly all of the world´s 12,000 pairs of waved albatrosses. It has an ample white sandy beach with a myriad of sea lions, perfect for relaxing. Its rocky shores make this site a great place for diving and snorkeling. May 21, 2019: Our morning landing will be at San Cristobal Island, specifically "Lobos Island". The name of this island means "Sea Lion Island." This appropriately named island is ripe with noisy, frolicking, jolly sea lions who will welcome you to their home with open, well, fins. 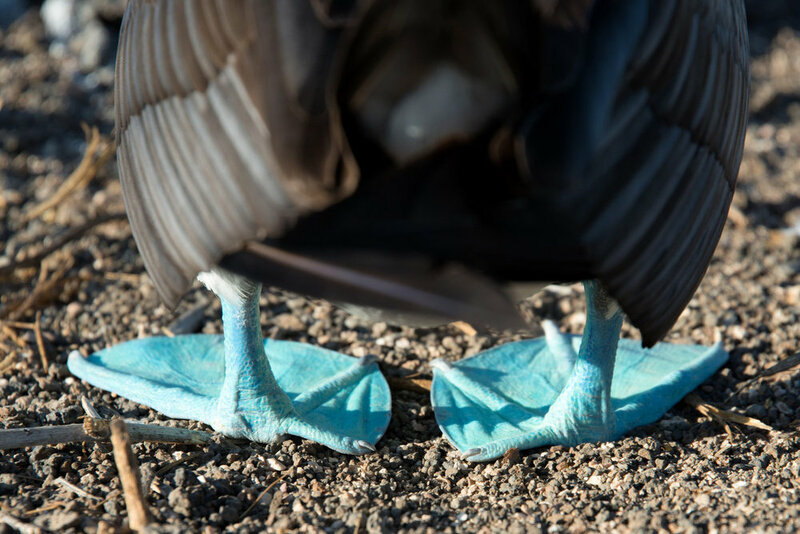 This island also offers great snorkeling opportunities as well as the chance to see blue-footed and Nazca boobies. We then disembark The Natural Paradise and transfer to San Cristobal Airport for our flight back to Guayaquil. We should be back in Guayaquil by approximately 2:30 pm Flights home can be anytime after 5:00 pm, or anytime on May 22, 2019. We will arrange a hotel room for you in Guayaquil if you are staying over on this night. International flights to/from Guayaquil, Ecuador. Airport transfers (Hotel shuttle available, and also cabs are inexpensive). Passport and visa fees. Travel Medical Insurance and Medical Evacuation Insurance (Required). Trip Cancellation Insurance (Optional). Meals in Guayaquil other than dinner on May 13, 2019. Hotel rooms in before May 12 or on May 21 or after. Alcoholic beverages, and any items of a personal nature. Anything not specifically listed as included. 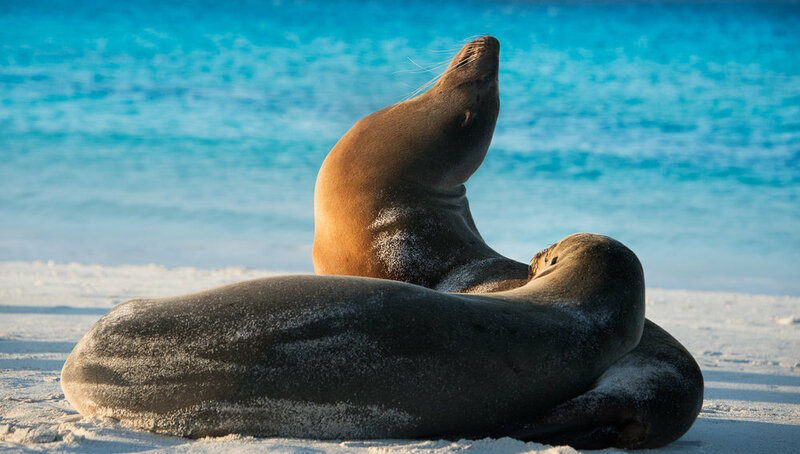 If you're looking for a small-group, intensive photographic Galápagos trip aboard an amazing private yacht with the best pros and naturalists in the business, look no further and click the "Sign Me Up!" button now because this workshop always sells out. See you in the Galápagos!